The gardens in and around Tucson, Arizona are quite different from those in my neighborhood. 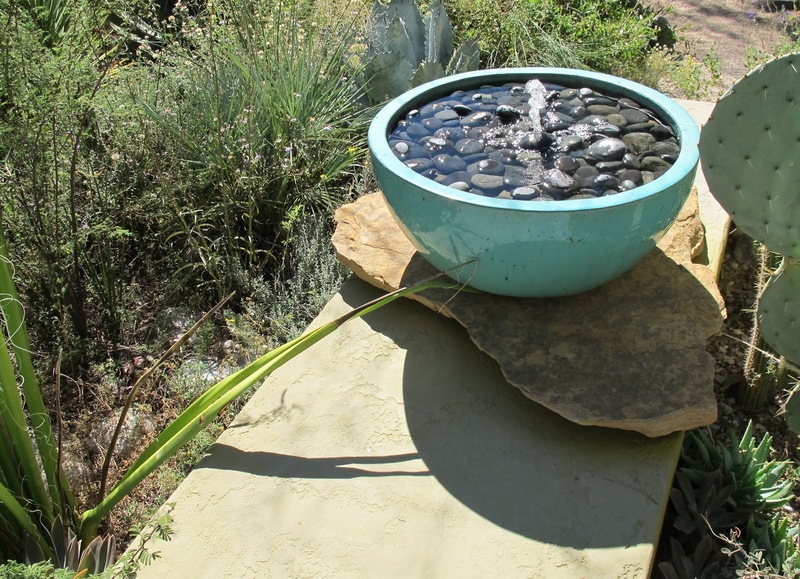 They are filled with cactus, succulents, agaves, and trees that have the tiniest of leaves, an adaptation that helps them survive in the desert environment. I didn't know, and still don't know, the names of most of the plants I saw when I visited Tucson for the Garden Writers Association symposium. If someone asked what a plant was I could just shrug my shoulders or help them find a plant label. I called most of the plants by the generic names - "cactus", "succulent", "tree". I joked at one of their local nurseries that the plants I saw were what we call "houseplants" here in the Midwest, though our houseplants don't get quite as large growing in containers inside as they do growing in desert gardens outside. I wondered how often gardeners in Tucson get stuck by the cactus they tend. I could only imagine the pain if you were leaning over a planting of cactus and lost your balance, as gardeners sometimes do, and fell into the patch. Ouch. I have just a tiny patch of prickly pear cactus tucked into an out of the way spot in my garden but I have been stuck with those spines enough times to know that one has to be careful around cactus. All kidding aside, I enjoyed seeing gardens in an environment that is so different from my own. I was intrigued how the gardeners in the desert planted gardens that were thriving in spite of the heat, in spite of the miniscule amounts of rain they receive. In the Tucson Botanical Garden, I enjoyed the personal touches in the Barrio (Neighborhood) Gardens, which "honor the distinctive gardens and yards found in the Tucson Mexican-American neighborhoods, and the pride with which they were created". 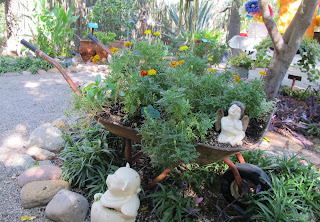 I can appreciate that whether a garden is just a pot of geraniums or an old wheelbarrow planted with common marigolds or an entire backyard filled with cactus, it is a beautiful garden if it is planted and tended with pride and care and good intentions. 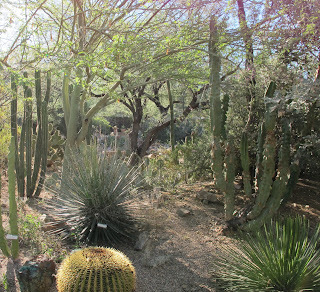 In one of the private gardens we visited, the sound of water amidst the cactus made me think about how precious water is in an environment as dry as Tucson. I got a glimpse of what my garden is like with no rainfall for three months this summer. It was not a pretty sight. I admire all the gardeners of Tucson who don't try to grow plants that need more water than their environment provides. After awhile, I think every gardener visiting gardens filled with plants they don't recognize looks to find something they have in common with those gardeners. I found that I have zinnias in common with Tucson gardeners. 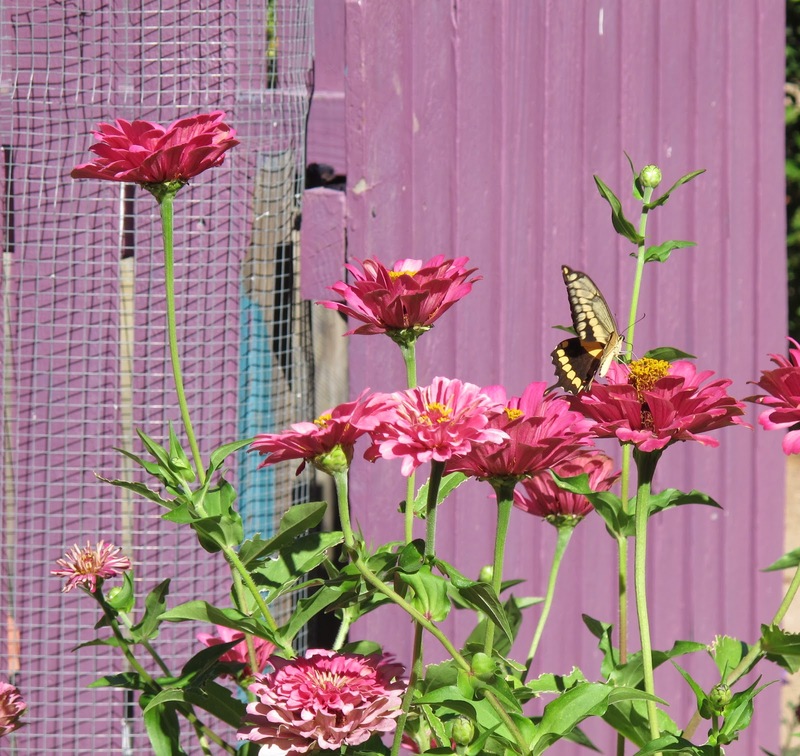 I always plant zinnias in my gardens because they attract butterflies. 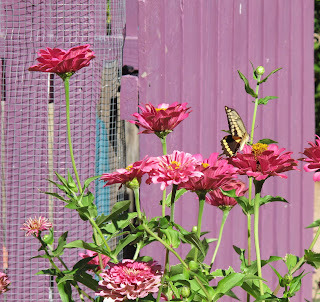 Even Zinnias in Tucson require some extra watering, but their bright colors don't fade in the hot sun, especially when planted against a bright background. 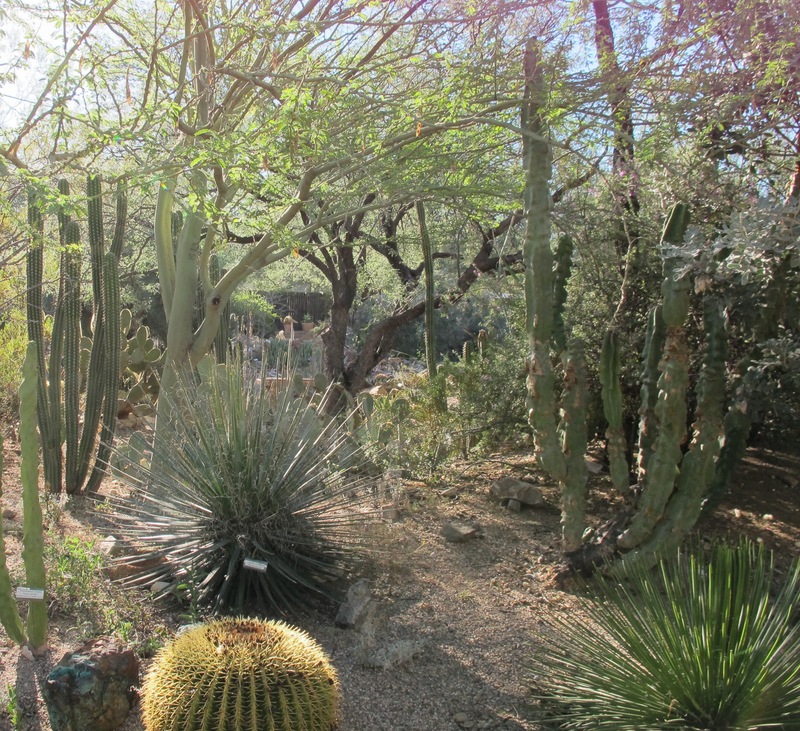 Throughout the long weekend of visiting gardens and talking to other gardeners, I was often asked "what do you think of the gardens of Tucson". I admire the gardeners who tend them. 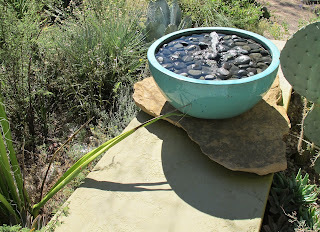 I think of what it must be like to garden in such a challenging environment and how in spite of the "dry heat" gardeners find ways to tend to plants and create environments that they can relax in and enjoy. I think it is always worthwhile to see a garden, even if it is one that you could never copy in your own environment, because every garden touches a gardener's soul. It may knock us over and give us that "big idea" to try in our own gardens or it may nudge us to be more appreciative of what we have wherever we garden. It may haunt us with its beauty long after we leave it or it may get lost in our subconscious and blend in with our overall knowledge of gardening. Regardless, seeing, feeling, hearing, smelling and walking through a garden, wherever it is, adds to our understanding of gardens and makes us better gardeners. 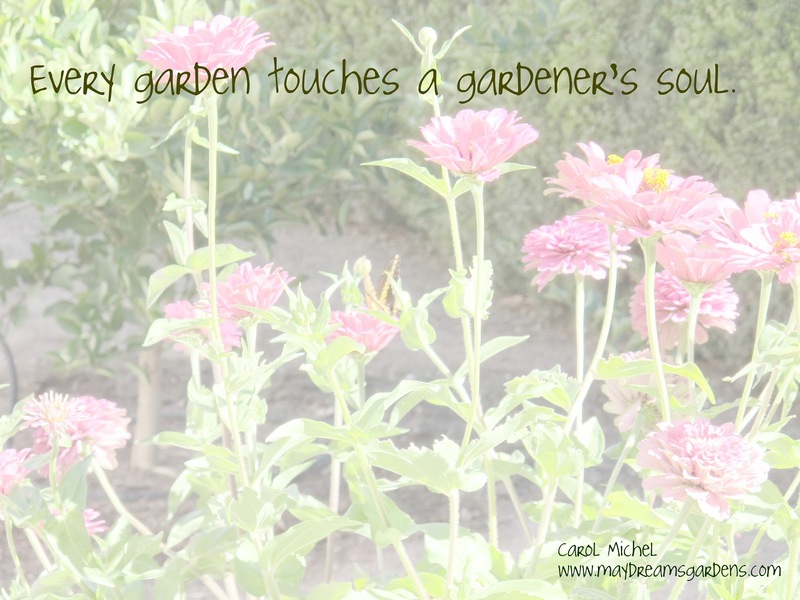 Every garden touches a gardener's soul. For this reason alone, every garden is worth seeing. I absolutely agree that every garden gives you something. It is always a treat to see other people's garden. Such wonderful stark beauty. I totally agree~every garden is worth seeing. Different, but with a wonderous beauty of their own! although those gardens don't "feel" soft and soothing like our midwestern gardens do, they do have a beauty all their own. Thanks for sharing! It has opened my eyes a new kind of beauty and it answered a question of what to plant against our west facing wall- a very hot microclimate that causes everything to wilt every afternoon---zinnias!!! Well said, Carol. There's much to enjoy in even very foreign gardens. When my daughter was living in Monterey, California, I spent a day visiting various public gardens in the area. I found them so very different from the lushness of my Southern garden. Beautiful in their simplicity, I learned so much but also came away with an added appreciation of my own geography and the gardens that come from it. It was such a unique beauty, wasn't it? I didn't know very many of the names, either, and we do have quite a few cacti and succulents here. Amazing how many different types there are around the world. Great to see you again. Are you bundling up for winter yet? I hear it was 80 today! A lovely, thoughtful post, Carol. Gardens are like people--they may be different, but each one has something special worth getting to know. I love that picture of the zinnias, it speaks to me. I have a stepping stone in my garden that says IF YOU TRULY LOVE NATURE, YOU WILL FIND BEAUTY EVERYWHERE. You are a true nature lover! I'm catching up on your blog and very excited to run across this post! I lived in Tucson for 7 yrs and spent many hours at TBG. 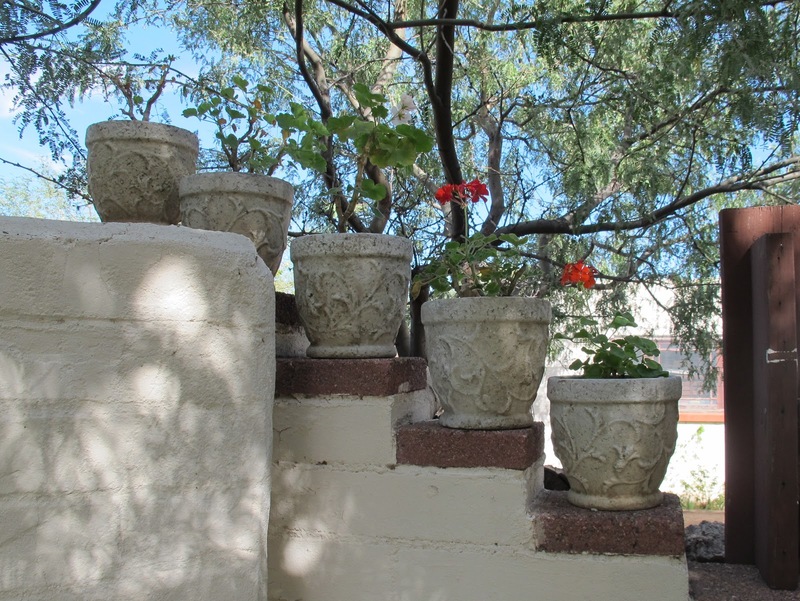 I became a true garden geek while gardening in Tucson. I miss my desert garden. I live in the North East now and enjoy my garden but it's just not the same.